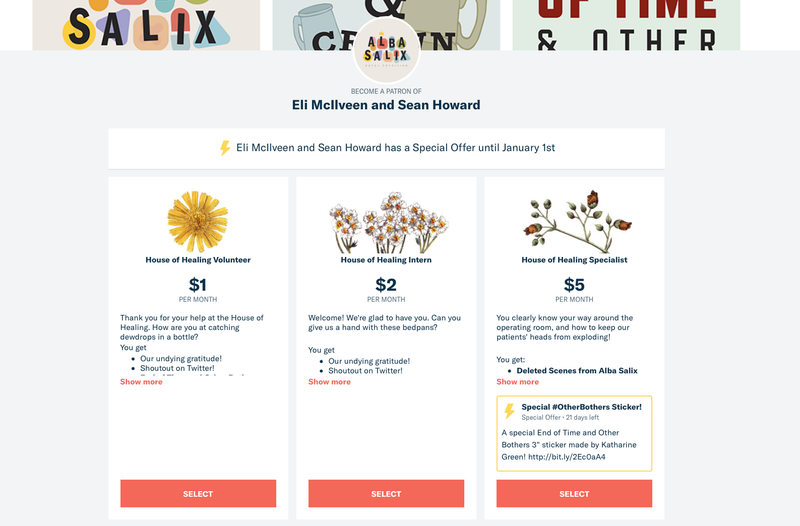 Special Offers is a beta program on Patreon that allows creators to give out a special reward to people who join at a certain tier within a specified timeframe. It’s a way to add some additional urgency to those who have been meaning to become a patron but haven’t gotten around to it yet. This is part of an ongoing series. You can start at the beginning if you so choose. 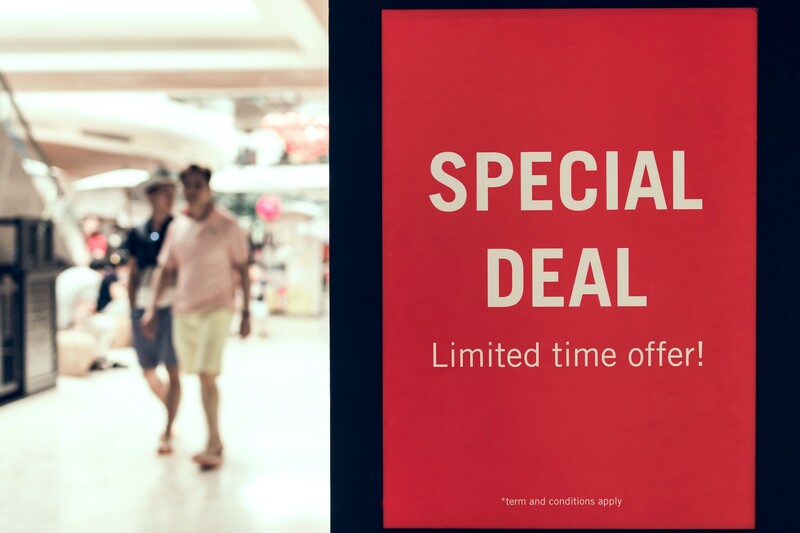 Note: This article was updated to include information on what happens when a Special Offer ends. You can see our special offer highlighted in yellow in the far right column. 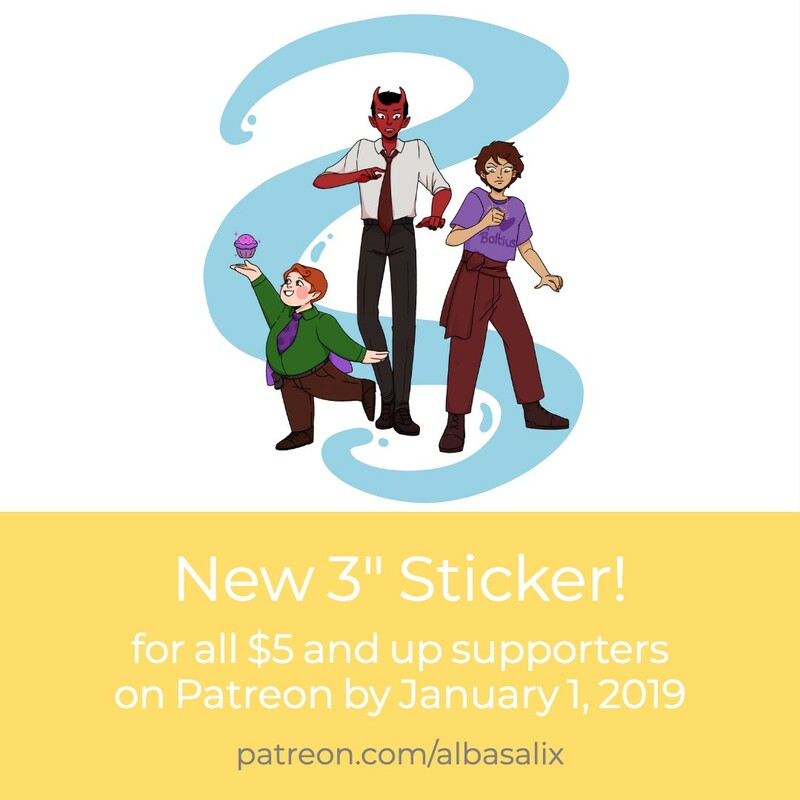 We are giving away a special new sticker to all $5 and up patrons who confirm their support by January 1, 2019. You can see also our Patreon post about it. 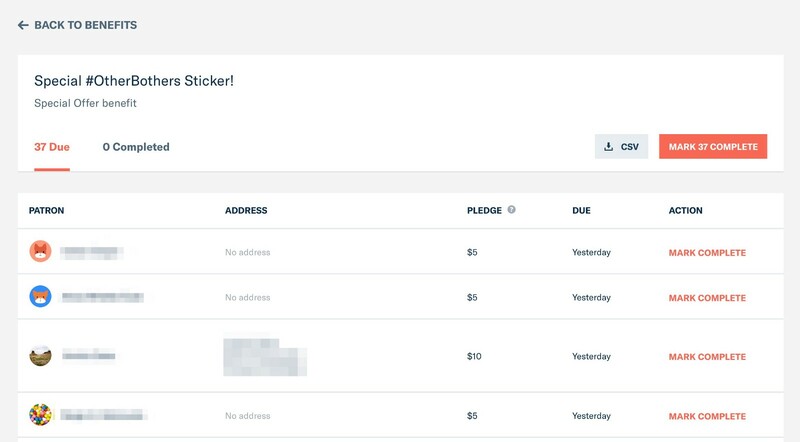 A special offer is a way to add a bit of a time-based incentive and also give you a new and exciting way to talk about Patreon support. Let’s face it, we’re all tired of shouting at people to support us. Patreon did a great job of getting the word out about this new program. They sent us an email announcement and then followed up with emails every few days that included a getting started video, marketing guides and great ideas on how to build momentum for a special offer. They even provided an online community of other creators who were choosing to participate in the program. We chose to offer a new sticker to anyone who chose to sign up on Patreon at the $5 or higher level by January 1st. We saw two of our current supporters upgrade their support to the $5 level within the first day of announcing the program. But I also realized that we weren’t going to reach enough people with the above. Our newsletter has 129 people on it. Our Twitter followings vary and our Instagram only has 330 supporters. The audio announcements we put into the feeds above spoke about why we created the Patreon community, some of the benefits for supporters and the special offer only available until January 1st, 2019. Patreon provided some excellent handouts for their Special Offer program. They pushed us to think about different ways to talk about this offer and in different channels. Finally, I came back to our newsletter of just over 100 people. This list is way too small. Even with a 5% conversion (unlikely), we were only going to get 5 people. But I did have a much larger list that was created with the release of my book, Creators 2.0 some years ago. So I set about crafting an email to everyone on that list. It couldn’t hurt. You can see the email I sent below. Taking stock on Dec 22nd. With about two weeks left in the campaign, I wanted to know where we stood. In a nutshell, we weren’t doing great. 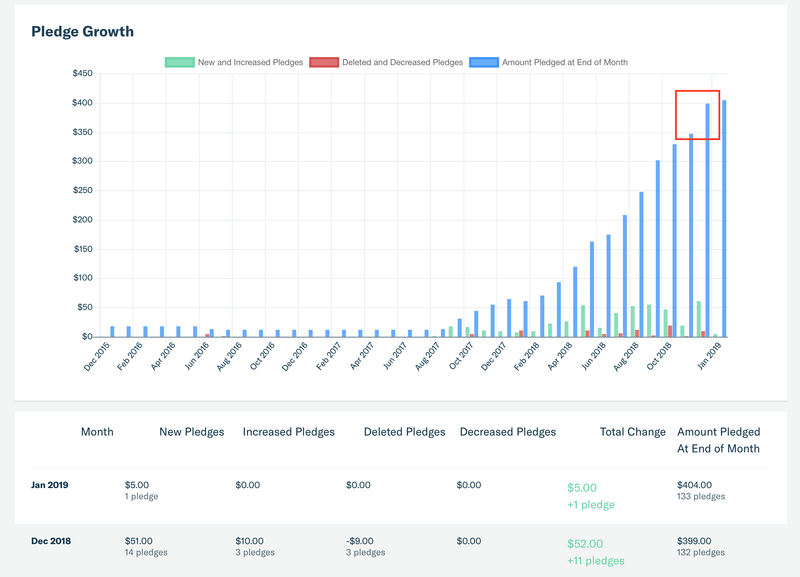 In addition to our normal volume of supporters at the $2 level, we had received two new $5 pledges and two supporters had upgraded their pledges to the $5 level. My next article in this series is specifically going to explore velocity. 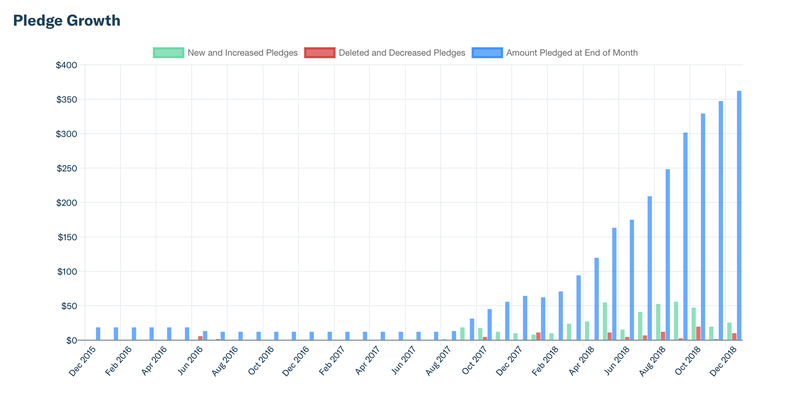 But looking at the curve above, you can hopefully see that our pledges are beginning to level out. Not good. We are a few days away from Christmas. Was this a bad time to launch a special offer? Perhaps. We had a strong message included in our Holiday special of The End of Time and Other Bothers but that wasn’t scheduled to go live until Dec 23. It was clear we needed to do more. But we chose to wait until after Dec 25th. Patreon recommends that all Special Offer programs include a strong push during the final week. A countdown was one of the recommended tactics, so we sat down and worked out a plan for the last five days of the campaign. Our idea was simple: let’s open up our locked content. For the last 5 months, we have been releasing special content every Friday for Patreon supporters at any level under the hashtag #farlorianfriday. We have also been releasing deleted scenes for our $5 and up supporters. We picked five audio pieces that up until now had been Patreon-only. These would go out on our public Alba Salix and The End of Time and Other Bothers feeds and include a message at the front explaining what we were doing and also pushing the Special Offer that closes on January 1, 2019. Please note that one of these items marked by a * was freely available but may have not been heard by everyone subscribed to our feed. We felt it was important to do something with value that we could launch on all of our audio feeds where we reach the most listeners and fans. And we also wanted to be sure to push the messages across Twitter, Instagram and Facebook. On each day, we created a countdown image and made posts across Instagram, our Twitter accounts and Facebook pages. In addition to the above, we released a video on January 1st to our mailing list and across social channels talking about our plans for 2019 and re-iterating our thanks to everyone. We included a brief note on how there were just a few hours left for the special offer. Patreon says, “Creators that have run Special Offers have been able to boost their growth by over 200%”. And while our spike in growth (see the red box in the image above) is significant it appears at first glance to be far less than 200% growth. But if we look at our net average growth from February through November we see that our average pledge growth is $28.60 a month. That is our current velocity. In December we had a net pledge growth of $52.00. Pretty darn close to 200%! The nicest thing about this growth is that is was strongly driven by the $5 tier, and not our $2 or lower tiers. Note that these results are for December only and do not include two additional $5 pledges on January 1st, the final day of the special offer. Your special offers show up as a Benefit which is super cool and easy to review and even download as a CSV. Note that it includes everyone else who has signed up at that level prior to your special offer. One really annoying thing is it does not request an address from new subscribers, even if you specified a physical product when you created your special offer. This means we now have to reach out to each person and try to get their mailing address as our $5 tier normally does not require addresses. Hopefully this is something they will fix when this feature moves out of Beta. My takeaway is that the Special Offer program was totally worth the effort required. It takes us into the New Year with a very strong velocity and with solid new fans. And the engagement around showing what’s available to Patreon supporters is likely to continue to drive new support as people come across the published episodes on our feeds. But a Special Offer requires a significant investment of time and exclusive content. It is not a magic bullet. We will definitely consider running something like this again at the end of 2019.